The Cincinnati Bengals off to a great start! You are here: Home / Cover Story / The Cincinnati Bengals off to a great start! The chant heard around the city….and the nation. The Cincinnati Bengals are a force to be reckoned with….they seem virtually unstoppable. Week after week, they are showing their stripes. Great quarterbacking along with super receivers, a strong defense, all add up to a winning team. Cincinnati’s winning team! Will it continue??? YES! The franchise was founded in 1967 and are members of the North division of the American Football Conference (AFC) of the National Football League (NFL). Their home stadium is Paul Brown Stadium in downtown Cincinnati . Big rivalries in the division with the Pittsburgh Steelers leading the pack, the Cleveland Browns and Baltimore Ravens not far behind. Well, Bengals just beat the Ravens…so bring on the Steelers! Led by Coach Marvin Lewis (second longest tenured NFL coach with 12+ years in the Bengals franchise), his confidence and “never give up” attitude seem to be rubbing off on all the players. The addition of Hue Jackson as Offensive Coordinator, now in his 2nd year with the Bengals, has proved to be a winning combination. 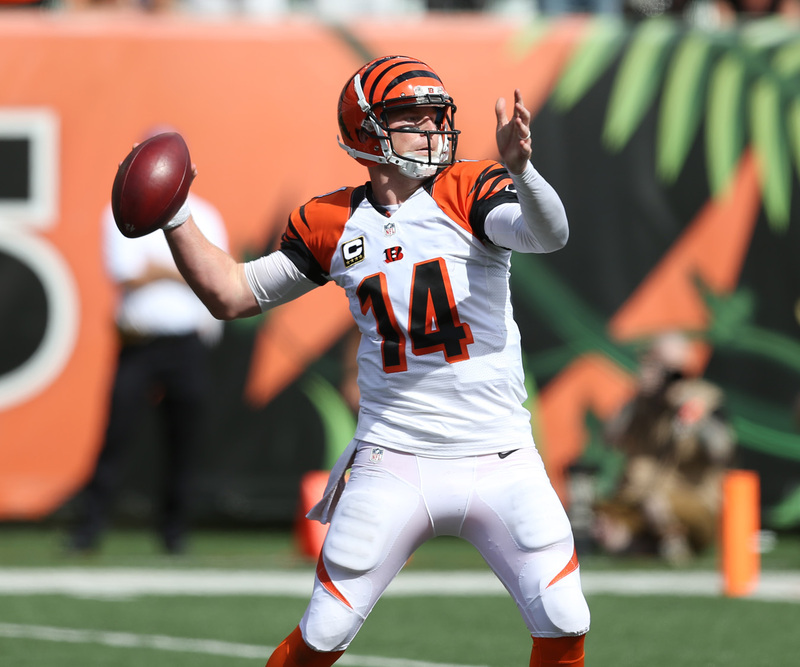 Quarterback Andy Dalton has led the team to at least 10+ victories every year. He is one of only two quarterbacks in NFL history to lead their team to the playoffs in their first four years. Everybody is hoping this will be the year for a playoff victory. How about that A.J. Green….an incredible wide receiver able to catch any ball thrown in his direction, with speed and endurance driving him into the end zone…a sheer pleasure to watch. So many great players, both offense and defense. There are a lot of games left this season, with so much win potential. How many will you be attending?? Be sure to get your tickets soon….with many Bengals wins, there’s sure to be a shortage!!! Be a part of the game, the crowd, the spirit. Who Dey think gonna beat them Bengals?? ?